This week, I've got back to back releases! On Monday the 15th, Broken Blades, written with Aleksandr Voinov. On Tuesday the 16th, The Best Laid Plans. They only had one night together—a stolen interlude at the 1936 Olympics. After Mark Driscoll challenged Armin Truchsess von Kardenberg to a good-natured fencing match, there was no resisting each other. Though from different worlds—an Iowa farm boy and a German aristocrat—they were immediately drawn together, and it was an encounter neither has ever forgotten. 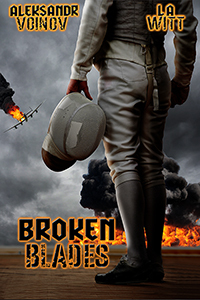 Now it’s 1944, and a plane crash in hostile territory throws them back together, but on opposite sides of a seemingly endless war. Facing each other as opponents is one thing. As enemies, another thing entirely. And to make matters worse, Mark is a POW, held in a cold, remote castle in Germany… in a camp run by Armin. They aren’t the young athletes they were back then. The war has taken wives, limbs, friends, leaving both men gray beyond their years, shell-shocked, and battered. The connection they had back then is still alive and well, though, and from the moment Mark arrives, they’re fencing again—advancing, retreating, testing defenses. Have they been given a second chance? Or have time and a brutal war broken both men beyond repair? It’s a foolproof strategy...until the emotional balance shifts. After yet another adoption falls through, Gabe is ready to give up, and Shahid isn’t far behind him. Apparently, being a gay couple—half of which is Muslim—is just one strike too many for the powers that be. When their friend Kendra offers to carry their baby for them, both men balk at first, but gradually warm to the idea. Especially Gabe, whose bisexuality is open to the chemistry among the three of them. The plan seems simple. Kendra and Gabe, foregoing the cold, impersonal IVF clinic, paperwork and red tape, will conceive the old-fashioned way. They’ll all share parenting responsibilities, and live happily baby after. But as the heat flares between Gabe and Kendra, Shahid’s long-suppressed insecurities bubble to the surface. Then some unexpected news catches the trio off guard and derails their plans—and now one heart could be left out in the cold. Warning: Authors subsist on the tears of readers. Please recycle your hankies by wringing out and reusing. We’d hate to be the cause of a worldwide shortage of Kleenex.